Well, our main zucchini variety is Costata Romanesca, an Italian heirloom variety that we really love. Italian zucchini, Italian sausage…. What could be more faux-Italian (yet really American) than pizza? So, I got a few large zucchini, and decided to make stuffed zuchinni, inspired by the flavors of pizza. I used some of my canned tomatoes, since fresh tomatoes are just starting to come in. But also a fresh one to celebrate. Add some fresh basil, and it’s a great celebration of high summer. I’m not sure stuffed zucchini boats quite gets the scale right… These are more stuffed zucchini super tankers. But, yum! Preheat oven to 350 degrees. Brown sausage in a medium skillet over medium heat. Meanwhile, wash zuccchini, and cut stem and blossom ends off. Cut in half lengthwise, and remove the seeds and pulpy core with a spoon. Place zucchini on baking sheets, cut side up. When sausage is done, add garlic and saute just until it become aromatic. Add the diced tomatoes and tomato sauce, oregano, and garlic. Reduce heat to low, and bring to a simmer, stirring occasionally. Spoon the sausage-tomato mixture into the zucchini boats. It should be just under level with the top of the zucchini. Don't over-fill, or you'll have a mess to clean up afterwards. Cover the sausage-tomato mixture with a generous layer of mozzarella cheese. Slice the fresh tomato into thin slices, then cut them in half. 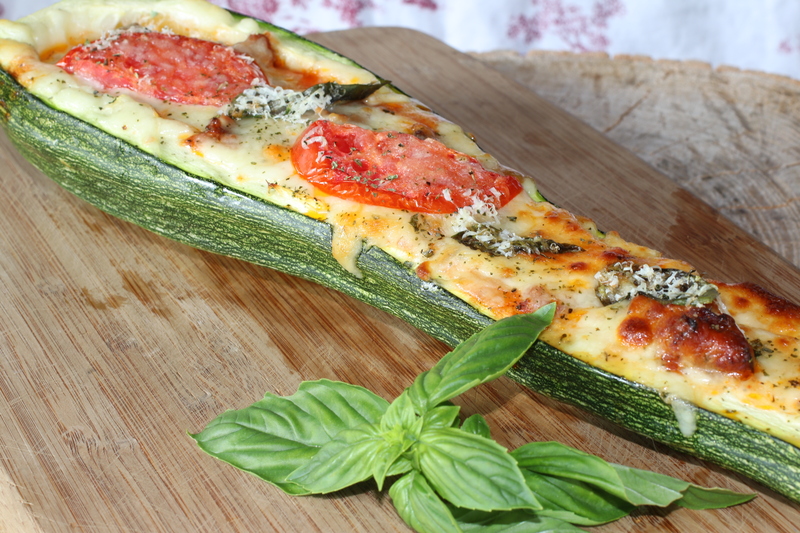 Arrange the slices on top of the cheese, about three pieces per zucchini. Arrange a basil leaf between each piece of tomato, then grate parmesan generously over the whole thing. Sprinkle with a bit more dried oregano. Bake approximately ____ minutes, until the cheese is golden and the zucchini is tender. Half a stuffed zucchini boat is a hefty serving!